Safe Withdrawal Rates (SWR) strategies, spawned by the so-called Trinity Study1 in 1998, are based on a dangerous assumption — that the future will look like the past. Now, most everyone knows that is a ludicrous assumption. Nonetheless, in finance we sometimes pretend that is it not, and in our closets we Baby Boomers hang on to our plaid bellbottoms, just in case. More and more, researchers are raising serious doubts about that "history repeats itself" assumption. Dr. Wade Pfau studied withdrawal rates in other countries and found that the U.S. was an exception. The widely-advertised 4% to 4½% withdrawal rates weren't safe globally. In subsequent studies, Dr. Pfau concluded that more frugal withdrawals would probably be needed for today’s retirees to achieve a 95% chance of their portfolio lasting 30 years or more in this country. Maybe closer to 3%. A recent study by Pfeiffer, et. 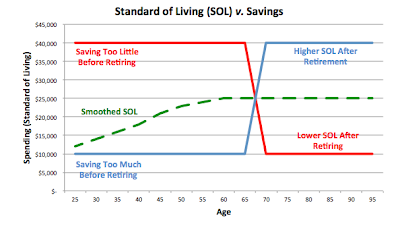 al., entitled The Benefits of a Cash Reserve Strategy in Retirement Distribution Planning, investigated the benefits of maintaining a one-year cash reserve account, but I found the results of the Reverse Dollar Cost Averaging (RDCA) scenarios most interesting. RDCA is another name for constant-dollar withdrawals, or Safe Withdrawal Rates (SWR). The study (excellent video explanation by Dr. Pfau here) compared monte carlo simulations of RDCA and a similar strategy that held one year’s expenses in a cash account to minimize having to sell stocks when prices were low. A major difference between the Pfeiffer study and the Trinity and William Bengen studies earlier is that Pfeiffer considers transaction costs and taxes and “a future of lower investment returns than seen in the historical data” based on recent capital market projections (that's current predictions of future stock market returns for those of you who speak English). The results? In a tax-deferred environment (401(k), IRA, etc. ), with a 4% withdrawal rate the cash reserve strategy improved 30-year portfolio survivability by nearly 5% from . . . wait for it . . . 55% to 59.4%. 55% to just under 60%. 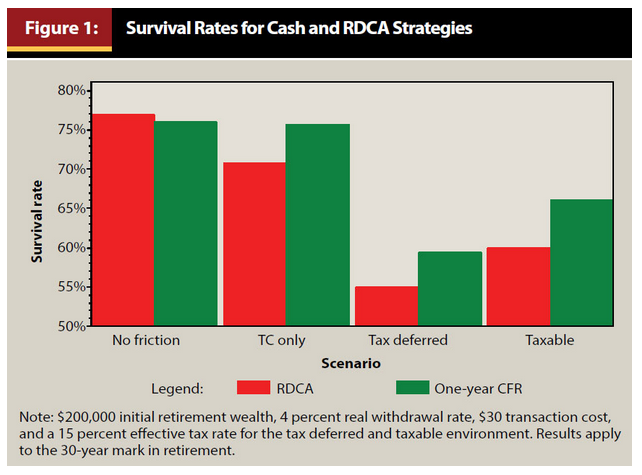 In a taxable environment, cash reserves increased 30-year survivability with 4% withdrawals, but from a very risky 60% to a still risky 66%. The following chart is a summary from the Pfeiffer study. The first pair of columns represents an unrealistic environment with no taxes or transaction costs. The second pair represents a ROTH IRA scenario with only transaction costs. The third pair represents a tax-deferred (IRA, etc.) environment and the fourth pair a taxable environment. 95% isn't even on the y-axis. What happened to 95% survival rates and 4½% withdrawals? If Pfau and Pfeiffer are correct, history won’t repeat itselPf. . . sorry, itself . . . and 4½% won’t work. If history does repeat itself and the U.S. stock market continues to outperform the rest of the world, Bengen was correct and 4½% will work. It’s unknown. And unknowable. Check back with me in thirty years. But, the newer research nowadays seems to point to significantly lower sustainable withdrawal rates. Maybe they’ll all be wrong. In his early writing at EfficientFrontier.com, William Bernstein wrote that retirees shouldn't expect any rate of success greater than 80%. That "everyone being wrong" thing happens a lot with financial projections. A quite successful money manager used to predict the coming year’s market returns by waiting for other money managers' predictions and then picking the range that no one else picked. It worked amazingly well until the others caught on and they all started waiting. "The word planning is emphasized because of the great uncertainties in the stock and bond markets. Mid-course corrections likely will be required, with the actual dollar amounts withdrawn adjusted downward or upward relative to the plan. The investor needs to keep in mind that selection of a withdrawal rate is not a matter of contract but rather a matter of planning." 95% survivability of your investment portfolio with 4½% annual withdrawals isn’t carved in stone somewhere. In fact, 60 may be the new 95. 2I think the studies show that your probability of success is a function of the value of your portfolio at any point in time (not its initial value when you retire) and the number of years remaining in retirement. In other words, you have to reassess the safe withdrawal amount periodically, and the safe withdrawal rate increases as retirement progresses. A lot of retirement planning revolves around your expectations for the end of retirement. You need to begin with the end in mind, as they say. 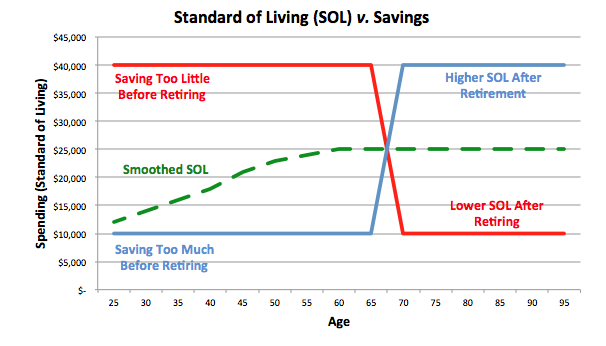 There are two basic schools of thought regarding retirement financing. The first, explained by Zvi Bodie in The Theory of Life-Cycle Saving and Investing, is often referred to as the life-cycle approach, or sometimes the "safety first" approach. It is based on the principle that you should first secure your minimum acceptable lifestyle by investing in safe bonds, life annuities and the like, and only then risk what's left of your savings in the stock market in hopes of improving your lot. The other school is represented by Safe Withdrawal Rates (SWR) and refinements of that strategy and is predicated on making a stock portfolio "safe enough" to minimize the chances that you will go broke late in life. No one, including SWR advocates, will tell you that this strategy will work 100% of the time. In fact, they shoot for about 95%. So, the bulk of retirement planning revolves around how important it is to you and your spouse to be financially secure if one or both of you live long lives. For retirees like me who want as close to a zero percent probability of going broke in their nineties as they can possibly arrange, betting on how long we will live or counting on a wonderful next thirty years of market returns isn't good enough. We know that we might live to 95 or 100 and that the market might not bail us out. But not everyone feels that way. Some feel that a 5% chance of running out of money is an acceptable risk for the opportunity to improve their standard of living. Or maybe they're convinced that longevity isn't their fate. Neither of us is right or wrong. We safety-first people are simply less willing to take that risk than are the SWR crowd. The group that worries me are retirees who believe they can have both a perfectly safe retirement and invest the bulk of their savings in the stock market. They hope to find a magic withdrawal rate, buy equity-indexed annuities that promise stock market returns with no downside, or some other such "spending strategy". You can't have both. If you choose the stock market route, understand that you risk suffering a permanent reduction in your standard of living. If you opt for the safety-first route and the market goes straight up for the next 30 years, understand that you risk missing out on a huge, long-term bull market. With either choice, in the worst case outcome you'll need to feel good about saying, "I knew the risk. It was a wise decision. I'd do it again." If you don't think you would be able to say that, you're probably making the wrong choice. My personal feeling is that I would be happier with my current standard of living and missing out on a grand bull market than going broke late in life. Thinking that probably won't happen doesn't work for me. But, that's a personal decision. Knowing which school of thought suits you can be a huge help when you begin planning retirement. If you're a safety-first kind of person, your plan will include strategies like saving a lot for retirement, spending less after you retire, claiming Social Security benefits as late as possible, buying TIPS bond ladders and maybe even fixed annuities. A safety-first retiree ignores life expectancy and plans for the worst-case financial outcome — living a long time and going broke. If you're willing to risk financial safety in your later years, your available strategies will include stock and bond portfolios, perhaps saving less and spending more, maybe claiming Social Security benefits sooner. Perhaps you consider the probability of living a very long time an acceptable risk. You may do better or worse than the safety-first strategies and you might go broke. That's the risk. Most of the clients I work with spend the bulk of our time together struggling with the risks and rewards of these two approaches, generally trying to convince themselves that there is some way to have both maximum financial security in old age and the maximum opportunities possible with stock investments. There isn't a way to have both, but I'm not sure I have ever completely convinced a client of that. Need Help with Your Social Security Claiming Decision? 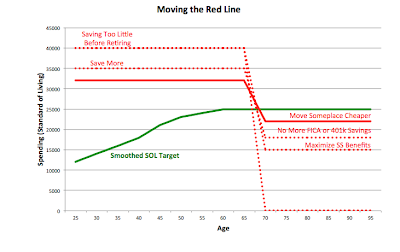 In my last post, I'm Not Ready for Social Security, I promised to provide an actual case study that I ran through the MaximizeMySocialSecurity.com (MMSS) website. That post listed several good free and paid websites to help you decide when to claim Social Security benefits. MMSS is the one I chose, in large part because I also use E$Planner. Joe and Sally (real people, fake names) are approaching their minimum age of 63 to receive (also minimum) Social Security retirement benefits. They are both relatively high earners in their current careers, though Joe earns quite a bit more, so his benefits will be higher. For various reasons, some wise though most unwise in my opinion, many people choose to claim Social Security retirement benefits at the earliest possible date, even though these benefits would increase about 8% a year for every year they waited. I asked Joe and Sally to send me earnings histories copied from SocialSecurity.org and I plugged them into MMSS. I then ran the software with the assumption that both would live to age 70. 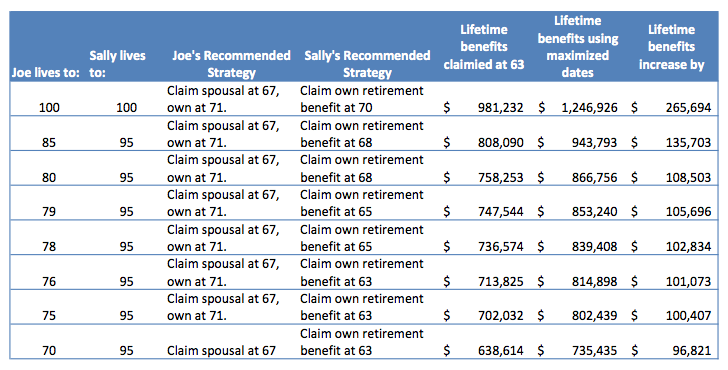 If both Sally and Joe had claimed their own retirement benefits at age 63 and died at age 70, their lifetime benefits would have totaled $282,712. Joe should take retirement benefits in Jan 2023, the year Joe turns 71. Joe should take spousal benefits in Jan 2019, the year Joe turns 67. Sally should file and suspend[ii] in Dec 2018, the year Sally turns 68. Sally should take retirement benefits in Dec 2020, the year Sally turns 70. So, what happens if Sally and Joe live to 95 instead of 100? MMSS recommends the same claiming strategy and forecasts lifetime benefits of $1,101,411. Still a nice number and $205,657 more than they would get from claiming early. I ran several scenarios for different longevities for Joe, but always assuming Sally would live to 95, which in my experience is not an unusual outcome. 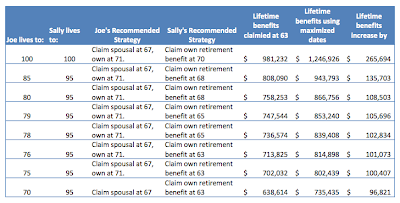 MMSS recommends in every scenario that Joe claim spousal benefits based on Sally’s earnings history when he reaches age 67 and delay receiving his own benefits until he reaches age 71. Sally’s recommendation is to always claim her own benefit (not her spousal benefit), but the best age for her to claim those benefits varies depending on how long she expects Joe to live. Now, I would never recommend that you base claiming benefits on how long you guess you will live, unless you have firm medical reasons to expect a less-than-average life span. If you guess wrong, you can be really screwed. Absent that kind of poor medical prognosis, I would suggest that Sally wait to at least age 68 to claim if she can afford to. The free AARP site provided similar advice, but not as detailed. That’s because the site uses life expectancy rather than allowing you to choose a planning horizon. It also uses income averages instead of actual lifetime earnings records from Social Security. 1. Social Security benefits claiming can be very complex (42,209 possible choices in this analysis), especially if you are married or divorced or one of you can claim a public pension. You need to consult a professional financial planner or use a reliable web-based tool. There are many possible strategies and the best websites, including SocialSecuritySolutions.com and MaximizeMySocialSecurity.com, will consider them all. Forty bucks seems a small price to pay with a hundred grand at risk. A qualified financial advisor would be a good investment, too. 2. The specific scenario in my example cannot be generalized. You might receive different advice if you were single, divorced, eligible for a public pension, a different age, or if your earnings during your career were significantly different than these. Don’t trust magazine articles that provide general Social Security advice. No single strategy fits all. That includes "always claim as soon as you can" and "always wait as long as you can." Tailor your strategies to your households’ specifics. 3. Your benefits claim can have a dramatic effect on lifetime benefits and your benefits may be the most important component of your retirement income if you weren’t able to save enough for retirement. There are two additional recommendations that I would make. First and foremost, think of Social Security benefits as longevity insurance to make sure you have income when you are very old, or that your surviving spouse does. If you were the higher earner, your spouse's survivors benefits will depend on when you claim retirement benefits. If you claim early, you not only lower your retirement benefit, you lower benefits for your surviving spouse for the rest of his or her life. Second, consider your claiming strategy within your overall retirement financing plan. It is difficult to identify the best claiming strategy without understanding when you will need that income the most. If you have a lot of savings or can work part time to cover your spending requirements for the first few years after you retire, claim later to receive greater benefits. Consumption smoothing software like E$Planner, or a financial advisor, can help you integrate Social Security benefits with the rest of your retirement plan. 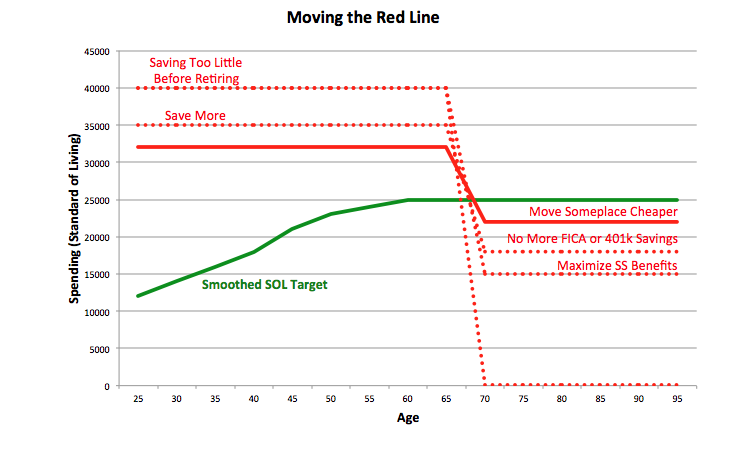 Claiming Social Security retirement benefits is very complicated and it is extremely important that you get it right. A lot of money is at stake. Unless you're an expert, get help. Claiming early might ensure that you squeeze every penny out of Social Security should you die early, but that’s like buying home or car insurance that only pays the small claims that you could afford to pay out of pocket. A short retirement won't cost much. It’s the big claims that can destroy your finances, and living to age 90 or older is a very, very big claim. Your spouse’s survivors benefits equal your retirement benefits, if you have begun receiving them. Limiting your own retirement benefit consequently limits your spouse’s survivors benefit. “File and Suspend” is a strategy for claiming your retirement benefits and immediately suspending them so you spouse can claim spousal benefits and you can keep the meter running on your own retirement benefit. You can read more here.